Like many modern video games, Far Cry 5 has microtransactions. Hate the concept? You can easily ignore them. Note: This is part of what we expect to be an ongoing series of posts explaining how the microtransactions in major games work. How much does this game cost up front? Far Cry 5 sells for $60. For that you get a lengthy open-world first-person shooter campaign and access to a multiplayer mode focusing on player-created maps. As with most games, there’s more game coming, for a price. It has a $30 season pass which will give players access to three single-player expansions and advance access to a re-release of 2012’s Far Cry 3, which will get ported to PS4 and Xbox One June 26 for non-pass-holders and May 29 if you dished out the money. Microtransactions in the game are tied to some weapons, vehicles and clothing. Well, technically, microtransactions are tied to a premium currency called Silver Bars that can be spent on so-called “prestige” weapons, vehicles and clothing. In all cases, using silver bars is optional All items in the game also can be purchased with in-game money earned just from playing. Prestige items include a car with a superhero painted on it and a shovel called “Optimism” that sports a happy face. The Comet can be purchased for 200 silver, which you can find in the game’s safes or buy as part of a $5 500-silver microtransaction. Like all prestige items in the game, you can also just buy it with in-game money earned by playing. Silver bars are sold in five different-sized packs, with Ubisoft’s in-game shop steering people toward a 2,400-bar bundle that costs $20. Going for a meager 500 bars would cost you $5. Can you get everything without spending money? Yes. There are no microtransaction-exclusive items right now. All of the prestige items that you can buy with silver bars can also be bought with fake in-game dollars, which you earn exclusively from playing Far Cry 5. That Optimism shovel, for example, can also be had for 3,600 in-game dollars. That’s not at all expensive. Having played a third of the game’s map thoroughly over the course of 12 or so hours and having bought a couple of weapons with in-game money, I’ve got 21,445 in-game dollars. Note that I’ve been playing a lot of the game’s excellent Prepper missions, which are little environmental puzzles that lead you to big stacks of in-game cash. You can also earn in-game dollars by hunting animals and selling their hides, or by picking and selling plants. You can even earn a perk that doubles your haul. Can you earn the premium currency through normal gameplay? Yes. According to Ubisoft, there are 1,000 silver bars hidden in batches of 40 in 25 of the safes hidden throughout the game world. That’s about 10 bucks of loot. You need to poke around a bit to find the safes, so earning any of this free silver requires some effort. Perhaps they want you to feel like you get a deal by playing the game thoroughly, which is a little Rusty’s Real Deal Baseball of them. Do the microtransactions impact gameplay? Technically they could, but not in any major way. Prestige outfits have no stats, so getting them doesn’t make you more powerful. Some prestige vehicles have guns, but so do many vehicles in the game that you can get by finishing missions or just finding them in the game’s open world. Prestige weapons, like all weapons in the game, do have stats, but the ones currently available in Far Cry 5 don’t have markedly better stats. And, remember, any prestige items, including weapons, can pretty easily be purchased with the heaps of in-game currency you can acquire through regular play. Far Cry 5 does have a multiplayer mode in the form of a map editor that supports co-op and competitive play. The game’s guns are used in those modes, and there is a shop in that mode where you can buy prestige weapons, but all of those weapons have the same stats as easily-unlockable non-prestige weapons. The prestige ones just have better paint jobs. Is there anything sketchy going on? Nothing major, but it is confusing that the game has two versions of its store, one of which makes it seems like prestige items can only be purchased with silver bars. The version of Far Cry 5’s store that players can access from the game’s main menu (a menu that is also visible whenever you pause) only shows so-called prestige items that have the option of being bought with silver bars and only list the silver bar prices for those items. If you instead access the game’s shops via the in-game store-owners you encounter throughout Far Cry 5, they will list a prestige item’s cost in both silver bars and fake in-game dollars. 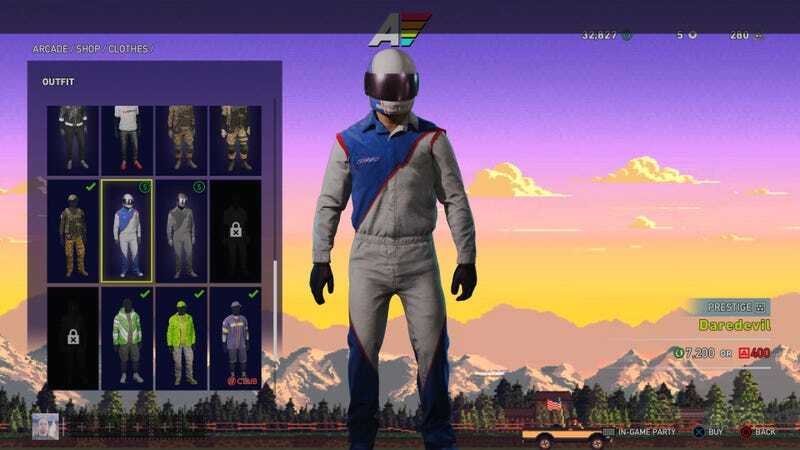 The Far Cry store accessible through the game’s main menu only shows prestige items and only lists prices in silver bars, the game’s premium currency. The Far Cry store accessible by speaking to vendors inside the game lists prestige and non-prestige items and includes prices in silver bars as well as in in-game dollars earned through just playing the game. Are the game’s microtransactions egregious? Right now, they’re not. A lot of the prestige items are reskins or normal in-game gear. Nothing seems overly potent, and the game is easy enough at its default difficulty to enable you to play without getting more than what you’d find through shopping-free play. Things might change, but Ubisoft has not yet filled the shops with fancy, highly-desirable items. At launch, Far Cry 5’s microtransaction system doesn’t seem that bad. Ubisoft has not offered anything that can only be obtained with extra payments. They’ve not dangled amazing gear that you just can’t amass enough in-game money in a reasonable fashion to obtain. Of course, the foundation is here for Ubisoft to go wilder. But, so far, so good.